Yesterday, we tackled an 8 mile circuit around the Patapsco Valley State Park. The hike was a wonderful one offering woodsy trails, gurgling streams and easy access to the Patapsco river. Unfortunately, we were trying to beat the mid day sun (which would reach a feels like of 118° by the time our hike was over), so we didn't have a lot of time to dilly-dally. 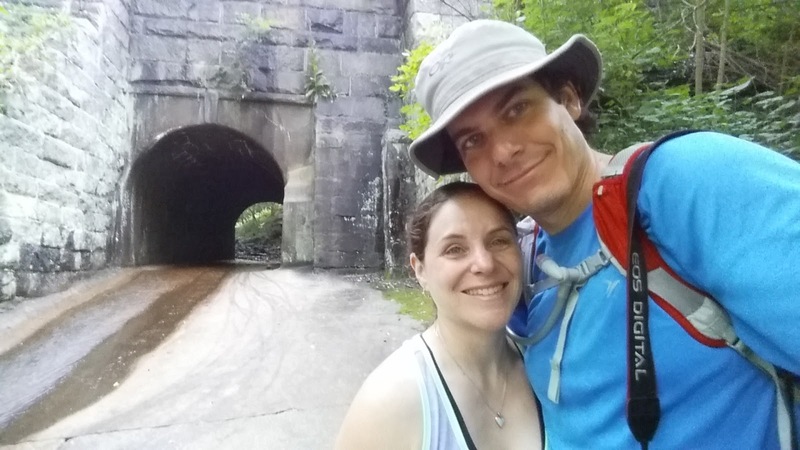 If we were to do this hike again, I'd want to plan some serious swimming and fishing time in the Patapsco river, as it offers lots of opportunities for both activities. Seriously, instead of hauling the family off to the beach, I could totally imagine taking them for a fun day on the river. The hike's rating of "moderate" seems appropriate. There were a few, relatively short uphill sections, but nothing too dicey. > We had no problem finding this parking lot. Just pull into the park, note the tire playground in front and as you take road to the right, turn off near the nature center. Then pull under the powerlines and park. follow them through the grassy field for about 1/2 mile before turning left into the woods on Santee Branch Trail. > We didn't do this, nor do I think you're intended to do this. Instead, we walked down the main campground trail for a few minutes and found where Santee Branch Trail cuts across. We went right. The Santee Branch Trail is blazed white and we followed these white blazes. At some point, the trail comes to a kind of T. To the left are white blazes, to the right are trees where the blazes appear to be covered up. We intentionally went right and confirmed that used to be the Santee Branch Trail and does indeed come out under the powerlines. You can save yourself the trouble and just go left. Just follow the white blazes. Turn right and cross under the powerlines again on Vineyard Spring Trail. > There were a number of unmarked trails coming into the Santee Branch Trail. We (correctly) ignored them. Eventually we popped under the powerlines and and sure enough, there was a trail that led off to the right, crossing under the powerlines and going into the woods. This trail, to our surprise wasn't marked. However, it's the trail to follow. So yeah, leave the Santee Branch Trail when you hit the power lines again, but know there won't be a sign waiting for you. > We followed the unmarked (but clear) trail until it hit a sort a junction. We followed straight for a short period of time, where it crested a hill and we could look down and see train tracks. We then backtracked to the junction and went left at it. Again, the trail is unmarked, but it looked to head down to the tracks. To our relief, this trail did indeed lead to a bridge that the train tracks ran over and we could walk under. > This is as advertised. go uphill on the Cascade Falls Trail. > This through me just a bit. You do go uphill, but only for a relatively short distance. I was expecting to climb back into the woods, but that's not what you do. Instead, you go uphill for a short distance and turn right. At this point, you're just trying to stay on a trail that parallels the river. If you see the river to your right, you're fine. Continue to follow the blue markers and the trail will route to the right, then downhill to the left to reconnect to the trail along the river towards Bloedes Dam. > We found a sandy path a few feet from the river. That worked. Though, above us appeared to be a road, which turned out to be the trail we were supposed to be on. Again, as long as you're following the river, you're fine. Don't overthink it. > There were kids swimming, men fishing and lots of people lunching along the river. Plan to do so yourself. > All of the above is as advertised. Don't overthink any of it - find out what blaze you should be following and stick to it. to return to the Hilton Parking Area. > We popped up at a parking lot felt like we were nowhere near our car. Don't panic. Just follow the road around and you'll see the tire playground from where you pulled into the parking lot. Tips: Bring hiking poles for stream crossings and rocky terrain. At least one liter of water per person for the hike. > We didn't bother with hiking poles and we were fine. The stream crossings are pretty basic. The one liter of water, per person is solid advice. Especially went it's frigging hot out! And of course, I've got photos!